Our hours are Wednesday 11am – 7pm, Thursday & Friday 11am – 5pm and Saturday 10am – 2pm. What are we? 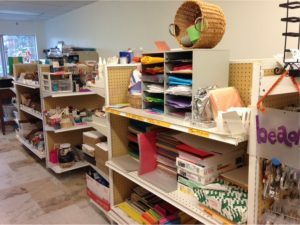 Scrap It Up is a place to find, donate and be inspired by a myriad of art, craft, and just plain cool materials! Why did we start? To help keep gently used art materials and upcycled items out of the landfill and give them new life! Who do we help? If you’re an artist, teacher, student, parent, kid, adult, or anyone else, we have something for you! Where are we located? Scrap It Up is located at 5935 Ridge Road in Pleasant Ridge.